Reiki for Healing and Optimal Well-Being. Reiki is a simple and safe energy balancing technique that benefits everyone who receives it. When your energy is balanced and flowing, self-healing and positive transformation happens naturally. 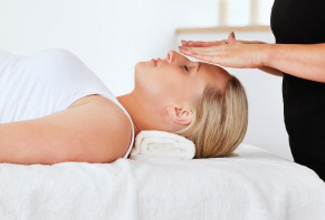 Reiki sessions are the ideal way to bring your body into that balanced sense of flow. Always directed to support your highest good, Reiki is a path to overall well-being, self-discovery and enlightenment. A simple and safe energy balancing technique, Reiki benefits everyone who receives it. Reiki works at the physical, emotional, mental, and spiritual levels to release the energy blockages that create dis-ease. It truly is an amazing energy that harmonizes moods and emotions so that you can move forward freely. Addressing the root cause of acute or chronic conditions, Reiki can be used as preventative or maintenance care for existing problems. Reiki is a wonderful addition to any health program and can be used alongside other complementary therapies or conventional medicine. Because Reiki is energy, it is not bound by time or space, it can be offered in-person or from a distance and is equally effective in both instances. Discover how Reiki can support your physical, emotional, mental, and spiritual health and wellness goals. You can expect a session to help you address the root cause of an acute or chronic condition and many feel that it relieves their symptoms. Regular sessions are also an important part of preventative and maintenance care. This energy balancing technique is a wonderful addition to any health program and can be used alongside other complementary therapies or conventional medicine. It’s important to note that Reiki is not a replacement for appropriate medical care. Instead, it supports medical care by accelerating self-healing, reducing pain or discomfort, and stimulating your body’s healing process. What will you experience during and after a session? Whether you’re receiving Reiki energy from Susan during an in-person session on-site at Two Bear Healing Arts location, or in the comfort of your home or over the phone in a distance healing session, the experience is profound. Since this is energy medicine and energy is not bound by time or space, there’s no difference in the “power” of the transmission. The energy affects everyone differently. The following are some common experiences, but really, the possibilities are endless! There are no limitations with Reiki. When is the right time for a session? The benefits and possibilities of Reiki have no limitations, and are endless. Many people have questions about Reiki. Susan offers her answers to the most common queries. Question: What does a Reiki session entail? Whether you receive Reiki from Susan on-site at her location or yours, she will create a very tranquil and relaxed atmosphere by playing soothing music and setting up her massage table. Reiki sessions are individualized to suit your needs. Susan will discuss your reasons for receiving Reiki and will describe the general flow of the session. You will lie down, only removing your shoes. Susan will guide you through a few moments of relaxation and then will begin giving you Reiki. If you’re new to energy healing, receiving Reiki in person can help you stay present and really “feel” the effects of the session. Question: When should I choose an at-home or a distance Reiki session? When you’re recovering from illness, injury, or surgery, receiving Reiki at home is ideal. There’s something special about receiving a healing session in the comfort of your own home. You can make it part of an in-house retreat – give yourself the gift of healing and don’t risk losing that “post-Reiki glow” by getting stuck in traffic on the way home! Do keep in mind that Reiki is energy and is not limited to time or space. Distance Reiki is very effective and offers the same benefits as in-person Reiki. Choose a distance session when you live outside of Susan’s travel zone.You may choose a mix of in-person and distance sessions as part of your Reiki treatment plan. Question: What does a Reiki Session look like? Someone receiving Reiki is lying fully clothed on a massage table. Unlike a massage, there is no physical manipulation of the body performed. Susan will gently place her hands in specific positions slightly on or above the body and move to new positions when necessary. Question: What does a Reiki Session feel like? The Reiki experience varies somewhat from person-to-person, but most people experience feelings of deep relaxation. Receiving Reiki is a calming, soothing, and reinvigorating experience. It is a peaceful, gentle process that empowers and enhances the well being of whoever receives it. Question: How many Reiki Sessions should I have? Everyone has different needs. Depending on the situation, results can be seen immediately or within a day or two. Sometimes it is necessary to do several consecutive sessions in a short period of time. During your initial consultation with Susan, she will recommend a Reiki plan that will help you achieve your wellness goal. You’re seeking a gentle, effective, non-invasive way to heal at the physical, emotional, mental, and spiritual level… Reiki is your answer. Plan on a series of appointments either on-site at Susan’s location, over the phone, or at your home if you are dealing with a chronic condition or need help working through a complex emotional or spiritual issue. Please note that Susan takes a truly holistic approach to health and healing. In addition to being a Reiki Master, Susan is also an Intuitive Counselor and a Certified Herbalist. Always dedicated to your needs and your highest good, Susan often integrates various modalities in her healing sessions. Intuitive Counseling is generally part of every Reiki session because it gives Susan the opportunity to communicate with your higher-self and spirit healing team to bring forward information that you need to know for your healing journey. When Reiki is combined with Intuitive Counseling, it is a very powerful healing tool. Learn more about Intuitive Counseling here and feel free to contact Susan to discuss your questions about how Intuitive Counseling and Reiki work together for your highest good. Although Susan prefers to include Intuitive Counseling into her Reiki energy healing sessions, she also has Reiki plans without Intuitive Counseling. Scheduling a Reiki session with Susan is an ideal way to bring your body, mind, and spirit into unison. Have questions before deciding? Send a message or call Susan at 845.512.8389 and learn how this amazing healing energy can create balance and harmony in your life. Be sure to read the Scheduling Policy & Details page. Reiki is energy and isn’t bound by time and space. Distance Reiki is very effective and offers the same benefits as in-person Reiki. Distant Reiki is ideal for people who are unable to attend in person sessions due to location or illness. Reiki and energy balancing work for you and your family. Please note: you must purchase individual sessions for each person in your home. Does not include Intuitive Counseling. or can help you work through an emotional upset. All sessions follow the basic outline described in the single session description above. With this comprehensive Reiki and support package you’ll have three 30-minute Reiki sessions. * Package must be paid for at once. * Package is valid for six months from date of purchase. Sessions can be used as needed. Please note: you must purchase session packages for each person in your home. Susan will call you to help you prepare for the session. You’ll talk for about 10 -15 minutes and share any questions or concerns that you’d like to address in the session. Immediately afterward, Susan will call you to share messages and insights that came through during the session. You may receive recommendations for additional therapies such as further Intuitive Counseling, herbs and basic nutrition, bodywork, and educational programs. You’ll realize that a single Reiki session opens a door to self-healing and insight you may have never imagined. There are so many past, present, and future issues and concerns to address. A series of sessions gives you an opportunity to get to the root of long term emotional, relationship, and health issues. With this comprehensive Reiki and support package you’ll have three 60-minute phone sessions. On-Site Reiki sessions are held at Two Bear Healing Arts location in Valley Cottage, NY. Susan will help you prepare for the session and you will fill out an intake and release form. You’ll talk for a few minutes and share any questions or concerns that you’d like to address in the session. You will then receive 60 minutes of Reiki and energy balancing work. If you would like Intuitive Counseling and Coaching included, please view the Reiki with Intuitive Counseling services below. All sessions follow the basic outline described in the single session description above. With this comprehensive Reiki and support package you’ll have three 60-minute on-sitel Reiki sessions. Susan will help you prepare for the session and you will fill out an intake and release form. You’ll talk for about 15 minutes and share any questions or concerns that you’d like to address in the session. The energy healing session is followed by Susan sharing additional messages and insights that came through during the healing session (15 minutes). All sessions follow the basic outline described in the single session description above. With this comprehensive Reiki and support package you’ll have three 90-minute on-sitel Reiki sessions. If you live in or around Valley Cottage, NY Susan would be pleased to visit you at your home, place of business, hospital, clinic, or hospice facility. All Reiki house calls include Intuitive Counseling. These at-home services are provided in Valley Cottage, NY and surrounding counties in New York, New Jersey, and Connecticut including: Rockland, Westchester, Putnam, Dutchess, Orange, Ulster, Passaic, Bergen, Fairfield, New Haven, and Litchfield. Basic house call rates apply to destinations within a 30-mile travel zone. See travel policies here to see which travel zone you live in and which fee applies. Susan will set up her massage table and help you prepare for the session. You’ll fill out an intake and release form then talk for about 15 minutes and share any questions or concerns that you’d like to address in the session. Live further than 30-miles, contact Susan directly to purchase a session. All sessions follow the basic outline described in the single session description above. With this comprehensive Reiki and Intuitive Counseling support package you’ll have three 90-minute house call Reiki sessions. I experience bouts of sadness. I can really tell the difference in my moods and how I feel if I miss a session. Reiki helps me to be calm and focused. It’s been a Godsend. I highly recommend it! Susan has a very compassionate nonjudgmental nature about her and is easy to talk to. Susan creates such a comfortable environment you can’t help but feel safe and deeply relaxed. She brings incredible focus and passion to her sessions. I found that the healing process she initiated in me alleviated physical pain and released blocked emotions. Susan is a gifted and intuitive healer. After the first session I felt a big release that provided me with a sense of relief and assurance that I can achieve my goal of attaining inner peace and well being. General Inquiries, Engagements, or Just to Say Hello.